Walk to Juanita Beach Park and Village from this exquisite light-filled retreat with gorgeous waterfront views and ample space to entertain! Custom built with a gracious open floor plan, the 5 bedroom, 5.5 bath beauty embraces nature with walls of windows bringing the outdoors in. Gourmet kitchen is a showstopper featuring custom cabinets, top-of-the-line ss appliances, walk-in pantry, and convenient breakfast bar. Get inspired in the private study with 180 degree views, or take a moment for yourself on the rooftop deck overlooking Juanita Bay – perfect for sunbathing, wine tasting, or catching up on a good book. Nothing compares to starting and ending each day from the stunning master suite! 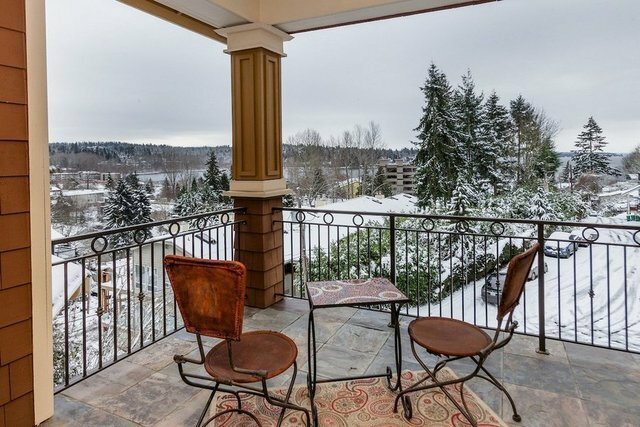 Ideally positioned to capture the magic of the Pacific Northwest sunrise, it affords a private lake view terrace, cozy fireplace, spa-like bath, and his-and-hers walk-in closet. Guest rooms are equally appointed with the highest attention to detail, including a versatile nanny’s quarters or mother-in-law suite with full kitchen on the ground floor. Outdoors, you’ll love the soothing sights and sounds of the year-round natural creek with a tranquil waterfall. A truly rare & luxurious offering!